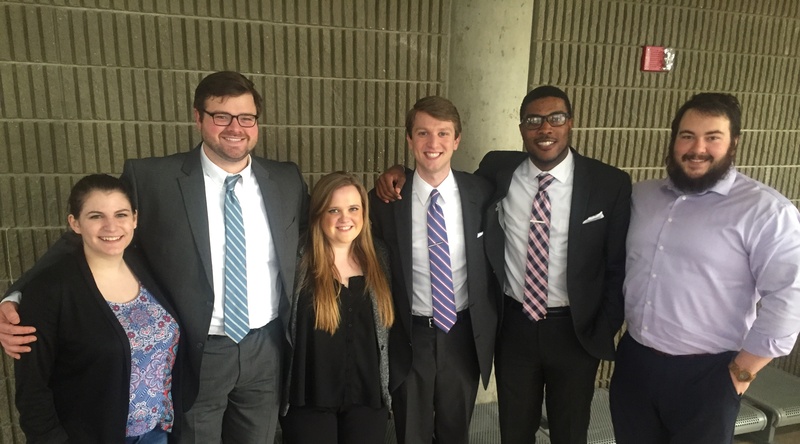 Belmont’s College of Law recently sent two teams to the American Association for Justice Mock Trial Competition in Louisville, Kentucky. The team of Will Blackford, Whitney Vaughn, Jeff Walker and Taylor Wilkins defeated Washington University and University of Illinois, the competition champion, and narrowly lost to Notre Dame by one point. The team of A.C. Agee, Zac Barker, Nelson Suarez and Tim Wills were undefeated until the final round. They defeated Southern Illinois University, Indiana University and Washington and Lee University until being narrowly beaten by University of Illinois. For the third year in a row, Belmont has been in the regional final round. Belmont has only competed in this competition for four years. These students were coached by Professor Caple-Shaw with assistance from alumni Dayne Geyer (’15) and Sara Page (’15).